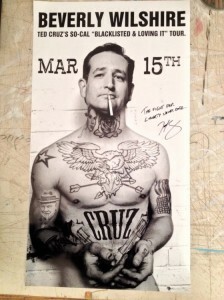 In case you hadn’t heard, HBO’s True Blood aired an episode on Sunday in which a fictitious fundraiser for Ted Cruz turned into a bloodbath as numerous Republican attendees were slain by murderous, blood-sucking vampires. It’s possible that Valerie Jarrett consulted on the episode. Well, I’m sorry to have lost the vampire vote, but am astonished (and amused) that HBO is suggesting that hard-core leftists are blood-sucking fiends…. 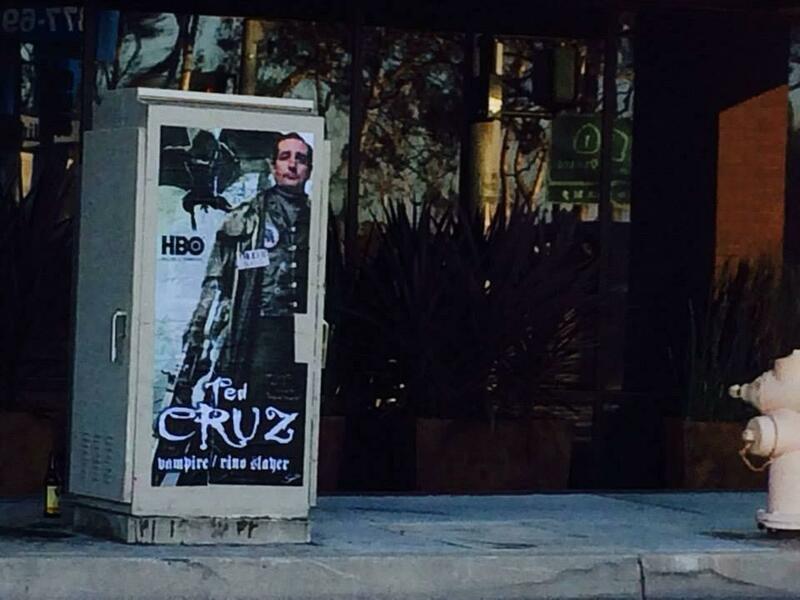 Today, Sabo launched a new street poster in response to Sunday’s True Blood episode called “Ted Cruz: Vampire / Rhino Slayer,” and it does not disappoint. 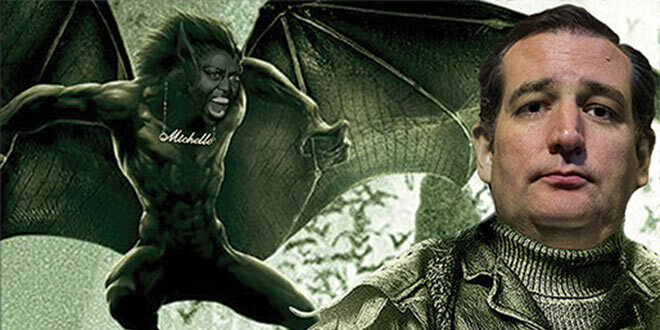 In an unexpected and hilarious twist, the poster also lampoons First Lady Michelle Obama, who was recently called out by comedienne Joan Rivers as being transgendered. 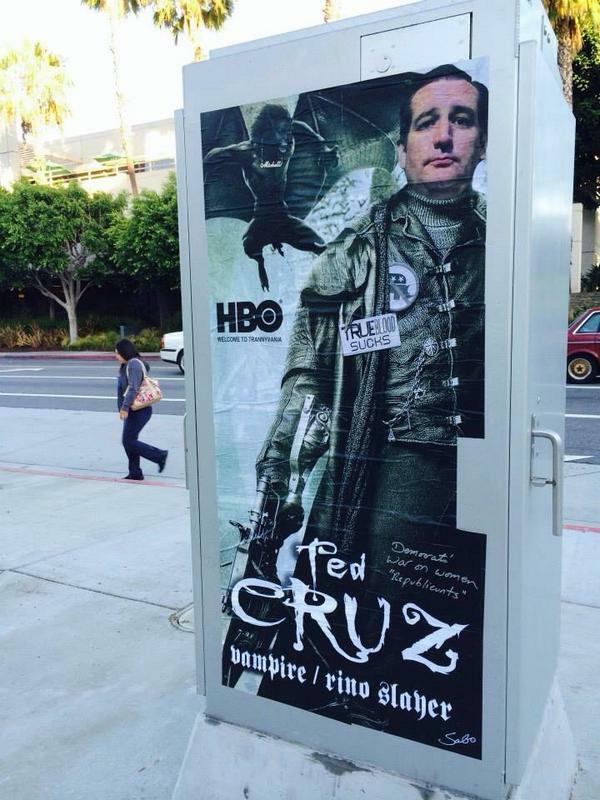 The poster shows the HBO logo, under which is the slogan “Welcome to Trannyvania,” and features Michelle Obama depicted as a frightening, winged (and masculine) vampire bat in active pursuit of Cruz. It wouldn’t be the worst thing that he’s faced.